What '80s Hair Band Should You Have Been In? At the party? I am the party! 2 things: Drinkin' & Fightin! Air Guitar or Air Drums? Air nothin' - gimme a mic - I'm about to start screamin'! Movie time! What ya watchin? Sci-Fi! It's not just for nerds anymore! A romantic comedy - there - I admitted it! Seriously! Jeans & black concert T-shirt! A little hairspray, a little makeup, is that so wrong? L.A. - land of the Sunset Strip! Hey! How about the Northwest? What do I look like? Someone who knows geography & the bands from... there? Ballads - OK? I said it! Just gimme good, hard rock! Devil Horns all the way! A van! For all the instruments! Something to save the environment. Can't metal have a conscience? In a word: Prog. Operatic vocals. Concept albums. Political lyrics. 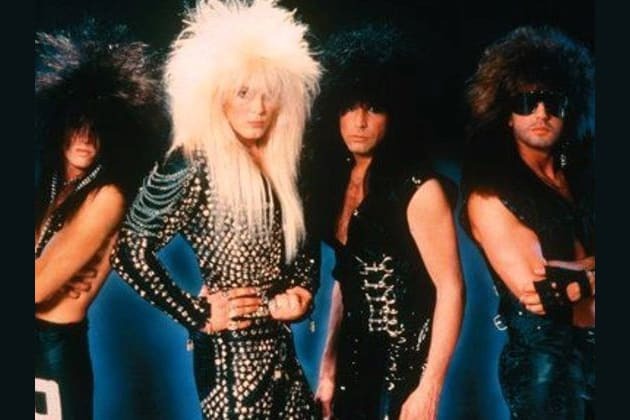 How did these so-serious guys make it as a top hair band? And in the land of grunge, no less? If you're going to hang with these guys, you'd better be serious about your music - they practically built an Empire! How did these acoustic-loving, ballad-writing guys not-from-LA make it as a top-of-the-charts hair band? Still - gotta love them. They made their own mark! Don't you wish you could just hang out with these guys in a garage with a few beers and a dart board? Well, the "British invasion" wasn't supposed to hit the Sunset Strip. But these guys did it - and upped the L.A. ante! From ballads to hard-hitting bombastic rock - come on - there were a couple songs you liked by Leppard - you know there were! Didn't you think it'd be fun to hang with them in London and get a photograph? These guys might not like you. Then again they might. Then again they might keep you waiting two days before they show up to the next gig. I mean - you're cool with that, right? You got a problem? Welcome to the jungle, baby! Eddie. Alex. The others. The legacy. What can we say about one of the greatest bands? Well now you can finish what they started. And hey - wanna be singer? Great legacy musicians in their own rights, Whitesnake had a choice: Either make their image as an '80s hair band, or get lost in the shuffle of '70s musicians. They still made it with the big hair, makeup, glitzy videos and models. Lucky for you - here you go again! Love 'em or hate 'em, you gotta respect that they did something that no one else would in a crowd with no one else like them. Screaming vocals? Big hair? Bright stage show? These guys did it all. While being the "good boys" of hair metal. Big personalities, big stage shows, big hair. Who can forget the bombast of 80s metal and hard rockers? And the controversies and in-fighting! But which band should you have been in for your shot?